Physical therapy was a back-up career for Steve Pipe. He really wanted to try “the coaching thing.” But he quickly realized that, with coaching, it was going to be very hard to make a professional living. It was then he decided to take his undergraduate kinesiology major and head to physical therapy (PT) school. I was a sporty kid, jumping in and joining any and every school sport team. If it had a ball, I was all in. But, as with most kids that are active in sports, then came the inevitable sports-related injuries. And I had a ton of them, which had me frequently visiting local physical therapists. It was when I was around 16, after being treated for a separated shoulder, hurt ankle, and other par for the sports course injuries, that I realized this career might be a great fit for me. I was so appreciative of the excellent care I received, and I wanted to find a way to help others in the same capacity. Plus, the thought of having a career where I wasn’t stuck behind a desk was exceptionally appealing. I would say that I made the right choice: I wake up happy, go to work happy, and come home happy. In order to apply and go to PT school, you need a bachelor’s degree. I knew back in high school that I wanted to either go into PT or become a physician, so I took a bunch of sports medicine classes, as well as sciences, in high school. I knew I was destined to go to Washington State University—my whole family went there. It was the only place I applied; luckily, they had the programs I was looking for. I got my kinesiology degree there before taking a few years off to move to Hawaii. After I met my wife and we got married, we moved to Michigan where I graduated from the PT school at University of Michigan-Flint. I really enjoyed my time there. Physical therapy is a three-year clinical doctorate program. The clinical portion of it is why it’s called a clinical doctorate. You’ll have 2-2 ½ years of academics and then the clinical application, which is similar to when a physician does his or her residency. Now you’ll be expected to apply your didactic knowledge and actually use your hands to help people. That is why I wanted to become a physical therapist in the first place. In truth, there’s this big disconnect between the knowledge you learn in school and how you get to apply it in real life. You can be the smartest person in the world, bookwise. But, if you can’t apply it on the job, then you’ll have some major career troubles. Once you complete your clinical doctorate, you can branch out and specialize. Through the American Physical Therapy Association, there are different specialty groups you can look into: pediatrics, sports, orthopedic, and a variety of others. Essentially, you get more credentialing when you specialize. I went for something called Applied Functional Science—a fellowship, which is one year of advanced training. It basically means that we’re trained to take the human body, break down how it is used typically in everyday life—walking, running, sports, things like that—and apply the biomechanics, the way the body is used in a variety of activities. When you look at the body, the way the muscles, joints, nerves, blood vessels, and all those work together when you’re doing a functional activity, it doesn’t always mimic what traditional exercise is. Kind of like how the machines you see in the gym create an artificial movement. It’s sort of a “functional” versus “artificial” concept. Using the range of motion offered by exercise machines, a setting that doesn’t happen naturally, is the opposite of applied functional science. We take the concept that you want to make the rehab as authentic as possible. You select a rehab route for the patient that will get them better the quickest and is the most relatable to whatever they are struggling with. First of all, be prepared to work your tail off in undergrad. You have to have really good grades to get into PT school. Branch out; do a lot of community service and other types of volunteer work. Plus, get experience in multiple PT settings. Depending on where you apply, PT school is very, very competitive. In many programs, schools will only admit about 10 percent of all applicants. But we, as a profession, are facing a shortage. So, many PT programs have upped their acceptance rate a bit to combat that. Your undergrad needs to take care of your prerequisites. Healthcare-related field programs like kinesiology, athletic training, sports medicine, and psychology are where you’ll get your basic health sciences like biology, chemistry, physics, and math out of the way. You can actually get your bachelor’s degree in any field, as long as it covers all the PT school prereqs. Once you get into PT school? Personally, I didn’t think it was too hard. It was busy, though. Sometimes, in one semester, you might have seven courses and one lab class. So, all week long, you’re going to class and labs. There are a lot of tests and homework. You’re just constantly studying. But by the time you’re in PT school, most of the students are extremely dedicated and very interested in their work, so you aren’t the only one with your nose in the books. The work was very interesting to me. Lots of subjects and lots of work. Classes are in sequences. Musculoskeletal, neurological, metabolic, and cardiopulmonary are all done in order to better understand the physiological aspect all the way through the treatment portion. And of course, as with any graduate program, you’ll have to do some type of project or dissertation. You’re constantly busy, studying, staying up late, or getting up early. Basically, expect a heck of a lot of work. Everyone in the career will have his or her own opinion about what he or she likes best about it. For me, it’s the interaction with my patients. It’s really nice to be able to see them and build relationships. There was a brief point where I was considering going the physician route. But, what prevented me from it was that I would only have about three or four points of contact with my patients. The consult when they first come in. Then, they’ll come in for surgery, where they’ll probably be unconscious. And then a couple of followups before they’re off on their way. With PT, we get to see people for a month or two, sometimes longer, and multiple times per week. You build a relationship, and you get to be a part of them getting better. Eventually, they’ll bring in their families, so you’ll even get to know them. You build these really long-term relationships that I absolutely love. Because I’m in a pretty small community, some patients have become close friends. It makes it a lot of fun. There wasn’t a ton of applied functional science (AFS) exposed to me in school. You have to pass the board exam; they just teach you all the basics so you’ll have enough of the didactic knowledge to pass them. So, there wasn’t a whole lot of AFS back then. I hear that nowadays, students are getting a bit more of it, but I didn’t get any of the training until I got out of school. That’s when I met a physical therapist that was going through the AFS training, so I started learning about it. It kind of got me hooked. In PT school, it’s a very comprehensive education. The second you get out, you specialize. You come out with this wide breadth of knowledge, but it isn’t until you get out of school that you really start figuring it out from there, once you get into your specialty. Also, join the American Physical Therapy Association. What I’ve learned through there has been invaluable. You don’t learn the business end of healthcare in school, and you need to. Through APTA, I’ve learned the business side of healthcare from insurance applications to reimbursements and other healthcare-related info. It’s starting to trend for PT, as a whole. It’s much more complex than what you’re thinking about when you’re in school. I would recommend to all PT students coming out of school to join into the PPS (Private Practice Section) and APTA, or any organization for their specialty, really. You need to learn these nuances and complexities if you want to keep the doors of your business open. This is a touchy subject for many PTs. I have a fairly strong opinion on it, as a career choice. To enjoy being a PT, you have to love what you do. In PT, unless you’re an owner, you’re never going to get rich. There are no schools you can go to that aren’t doctorate-level programs, which carries a high financial burden. So, when you’re in PT school and come out with a doctorate, you’ve spent seven to eight years of your life in school, and you are carrying $130K or more in debt. The pay doesn’t justify the education. It’s really hard, with a clear conscience, to tell someone to acquire that kind of debt in student loans with a 7 percent interest rate that you’ll have to pay back for the next 20 years. In the meantime, that debt is going to eat more than ¼ of your pay. At least, early on. You’ll make more money as the years go on and as you move your way up the food chain. But initially, when you come out of school? Those loans kill you. It cuts into your living expense. It’s not a BAD job, you don’t get paid POORLY, but that huge financial burden is awful. When you have an MBA, your pay goes up immediately. But in PT, you’re making essentially the same salary as someone who got into the profession with a bachelor’s degree, which years ago is all it took. I think the education itself is great. And the profession is only going to grow. The debt to pay ratio is my biggest gripe though. The good thing is, when you graduate from PT school, it’s to an average of three job offers. There’s a huge shortage, so students are bombarded with job offers right out of the gate. 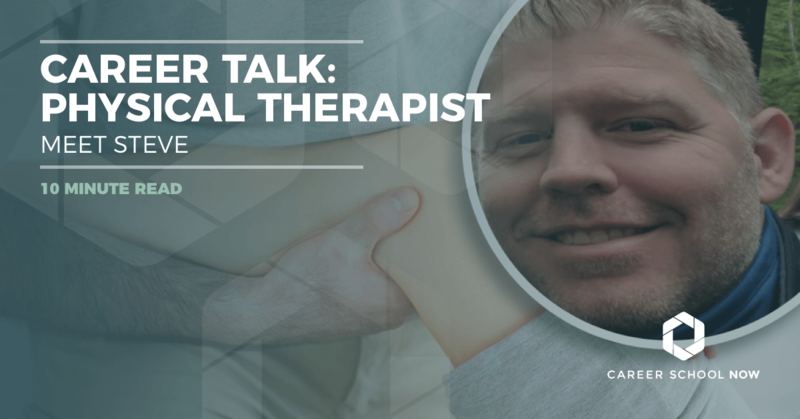 If a truly satisfying career is what you’re looking for, one that will keep you consistently happy, then become a physical therapist. While the student debt may make things a little tight for a while, your pay will definitely increase as you move up the career ladder. Learn more about becoming a physical therapist.